Built in neo-Georgian style with art deco undertones, the building comprises two pool halls, a large traditional Turkish Baths suite and an adjacent theatre and concert venue – City Hall. 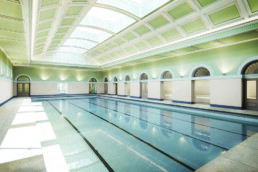 The pool is currently undergoing refurbishment and will re-open to provide a swimming pool, Turkish Baths, along with new health and wellbeing facilities, a new spa facility and a bistro café. Nicolas and Dixon-Spain, the architects, were appointed in 1924 following a design competition adjudicated by Alfred Cross, the renowned swimming pool architect. The pools were floored over in the winter months for a variety of uses including being used as a cinema. Being next to the City Hall meant that sometimes swimmers had to keep quiet to avoid disturbing orchestral performances. 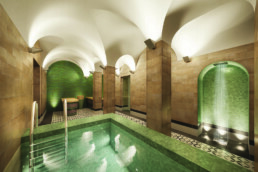 Fusion Lifestyle have acquired a long lease of the site and are investing £6m in the refurbishment to bring the City Pool and Turkish Baths back into use. 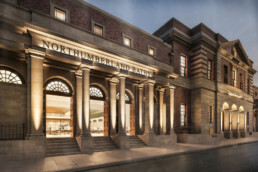 They have worked in partnership with the community campaign, Save Newcastle Turkish Baths. Work is currently underway and completion is expected in late 2018.